A new indie craft fair is coming to Ann Arbor this fall. Designed to showcase local talent, Liberty Local, will take place October 8 and 9 at the Ann Arbor Art Center. I caught up with Sam Solis, the Special Events Manager at Ann Arbor Art Center to get the skinny on this new event, particularly details for artists and crafters who are interesting in vending at the show. The show is currently accepting applications, with a deadline of Friday, August 5. 1. Let’s start at the beginning. Why did you decide to start an indie craft fair in Ann Arbor? What are your hopes for the first year? 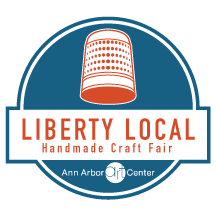 Sam: We wanted Liberty Local to support the Michigan indie craft scene with a show that focuses on original handcrafted work. We really believe in the idea that handmade art can be at your fingertips and wanted to bring an event to our community that could allow for this to happen. Wow-so many hopes for the first year… having amazing vendors apply, bringing in a great, buying crowd in October and of course, providing a fun, casual and creative atmosphere. We hope everyone that is apart of Liberty Local will want to come back for a second year! 2. Is the show juried? What types of work are you looking for? How many vendors will you accept? Sam: Yes. We are looking for all mediums including but not limited to- jewelry, fiber (knit, crochet, silkscreen), painting, printmaking (posters and cards), paper (letterpress), multi media and anything else that fits the indie aesthetic. We want all things unique, handmade and original! Liberty Local will be accepting 35 vendors. 3. Tell us a little bit about the Ann Arbor Art Center. Why are they a good fit for your event? 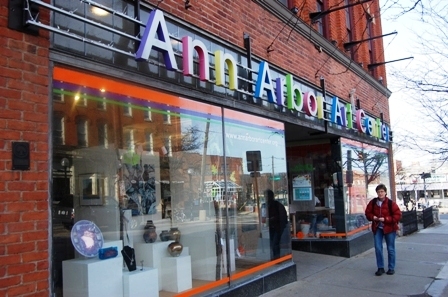 Sam: The Ann Arbor Art Center is a non-profit organization that has been around for over 100 years. This historic three-floor building located in the heart of downtown Ann Arbor provides the perfect backdrop to showcase all things creative. Vendors will get to showcase their art in gallery and studio spaces, which are the Art Center’s most inspired rooms. 4. How do you plan to promote your event? Can artists help promote? Sam: We will be promoting Liberty Local by marketing around Ann Arbor and surrounding cities, using social media, giving out mini-postcards to help spread the word and just general word of mouth. Artists are more than welcome to help promote and each accepted artist will be provided with materials to make this possible. Sam: Yes-we would love volunteers to help with the promotion of Liberty Local and will need help on the two days of the show, October 8 & 9. Contact libertylocal@annarborartcenter.org if you are interested in volunteering. Learn more about Liberty Local or check out the vendor application.